Lilac-pink flowers, VIII–IX; dark green foliage; vigorous; height 60cm; spread 60cm. White flowers, VIII–X; yellow-orange foliage throughout the year; low -growing but upright; height 16–20cm; spread 31–45cm. Named after Herman Blum, the finder's, second daughter. ♤ Bud-flowering(Knospenblüher), crimson(H13), buds to 5mm long, 2mm across;calyx rose-pink(H7); IX-XII; foliage: dark green, with mid-green new growth; habit: to 30cm×25cm after 3years (pruned). Buds redder than those of ‘Rosita’. Origins: a sport on ‘Rosita’, found in autumn 2010, byArmin Klose, Sandkrug-Hatten, Germany. ® C.2013:01 registered on 17 March 2013 by K. Kramer, Edewecht-Süddorf, Germany. Description in Supplement XIV (2014), Heathers 11: 68 is erroneous: the description above is correct. Little is known about this cultivar. However, from the image, Pink flowers; foliage dark green; habit very upright. Presumably a seedling; obtained from Manning's Heather Farm (Sebastopol, California, USA), by Clark and Edith Davis, California, USA, in 1990. "The lady we dealt with was Mrs Manning's neice and was very knowledgeable about heathers & told us she had developed 'Kenneth' and had named it." White flowers, VIII–IX, abundant; yellow-green foliage, turning greener in autumn, young shoots tipped white in spring; broad, upright; height 26–30cm; spread 46–60cm. It differs from 'Westerlee Green' in having a broader habit and the foliage is greener in autumn. Seedling; selected by A. Bosch (Westerlee, Netherlands); introduced by Bosch in 1991. Named after a frog puppet in a TV programme. White flowers [no other information available]. Mauve (H2) flowers, VIII–IX; downy, deep lilac-grey foliage, shoot tips pale yellow in winter, changing to red in spring; strong, upright shrub; height 30–40cm; spread 31–45cm. Very hardy. Selected by Brita Johansson (Vargön, Sweden) and named after her daughter. ❁ White flowers, VIII–IX; bright green foliage, tined bronze in winter; height 21–25cm; spread 31–45cm. A spectacular plant, certainly one the best widely available double whites. Found by Brigadier E. J. Montgomery at Kinlochruel (Colintraive, Argyll, Scotland) as a sport on 'County Wicklow'. Rich magenta (H14) flowers, IX–X; dark green foliage; height 31–45cm; spread 31–45cm. Flowers single, mauve (H2), solitary on short lateral shoots; VIII-X. Spreading plant with erect and ascending shoots; young shoots lime-green; mature plants appearing orange-red due to strong red tints that develop on sunlit sides of shoots, shaded foliage remaining light green; leaves minute, glabrous apart from some hairs on margins and at tip, densely clustered on short side shoots; Strong autumnal colours in mature plants, with pale flowers. Chance seedling found in August 2008 by Noel Allan at Galloway Heathers Nursery, Newton Stewart, Wigtownshire, Scotland. Named after the granddaughter of Noel Allan, Galloway Heathers, Cartyport, Newton Stewart, Scotland (in Sanskrit the name means "ray"). ® C.2012:04 registered on 8 August 2012 by J. Fitz-Earle, Crocketford, Scotland DG2 8QE. White flowers, VIII–IX; mid-green foliage, young shoots with yellow tips in spring; height 46–60cm; spread 46–60cm. Like all lings that have coloured shoot-tips, prune in October for best spring effect. Outstanding. Propagated by J. Haigh, Kirby Nursery, Isle of Man, before 1968. and introduced commercially by Tabramhill Gardens (Newstead Abbey Park, Nottinghamshire, England). Named after the nursery and the flower colour. Heliotrope (H12) flowers, on red stems, produced profusely, VIII–IX; pale golden foliage; upright; height 26–30cm; spread 31–45cm. Recommended. Much hardier than most golden lings. Named after the grand-daughter of the introducer. White flowers, VIII–IX, borne freely on upright curving spikes; bright dark green foliage; neat tidy habit; height 16–20cm; spread 31–45cm. Wild-collected; found at Kit Hill, near Gunnislake, Cornwall, England, by J. A. Michell by 1948; introduced by Maxwell & Beale (Broadstone, Dorset) about 1948. Named after the hill where it was found near Gunnislake, Cornwall. ♤ Bud-bloomer, calyx white; IX-XI; foliage bright green; habit upright. Deliberately bred seedling: raised by K. Kramer in 1991 (sister-seedling of 'Alicia'). A composite word, without meaning. Registered on 3 November 2002 by Kurt Kramer. ♤ Bud-bloomer; white; IX-XII; foliage bright green; habit broad, upright. ♤ Bud-bloomer, calyx white; IX-XI; foliage bright green; habit upright, compact. Deliberately bred seedling: raised by K. Kramer in 1991 (sister-seedling of 'Alicia'). White flowers, IX–X, on slender, tall spikes; dark green foliage, tinged brown; height to 50cm; spread to 50cm. Flowers lavender (H3) with crimson (H13), single; IX-XI; foliage new shoots pink and cream, turning greyish green in summer, foliage and shoots with prominent tomentum of long, somewhat shaggy hairs; stem appearing white; habit upright, bushy; height 50cm; spread 50cm after 5 years. Selected from seedlings raised from open-pollinated plant of 'Tallboy', possibly pollinated by 'Kerstin'. It looks like a vigorous mixture of the two presumed parents. Fantasy name. ® C.2015.07 registered on 21 September 2015 by Sten-Börje Sörensson, Almvägen 7, 475 51 Hönö, Sweden. 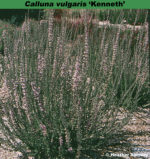 Lavender (H3) flowers, VIII–IX; dark green foliage, turning reddish in winter and spring; wiry, prostrate, forming a neat carpet; height 10–15cm; spread 31–45cm. Wild-collected; found on Oldenburg Moors, Germany, before 1932 by Herr Kuphaldt of Berlin; introduced by Hesse Nurseries (Weiner, Germany) in 1932. Named after the finder, Gartendirektor Kuphaldt of Berlin. Lilac-rose flowers, VIII–IX; dark green foliage; creeping, prostrate; height 10–15cm; spread 31–45cm. Found on Kuppendorfer Moor, Germany. Lilac-pink (H11) flowers, VIII–X; dark green foliage; a neat ground hugging plant; height 16–20cm; spread 46–60cm. Wild-collected; found on The Lizard, Cornwall, England, by Mr & Mrs D. F. Maxwell (Corfe Mullen, Dorset) in 1923, and introduced by Maxwell & Beale (Broadstone, Dorset) in 1927. Named after Kynance in southern Cornwall, England.